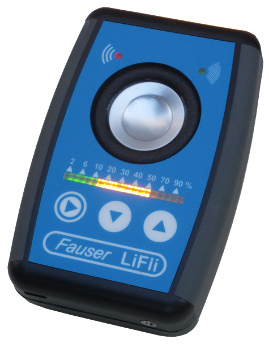 The light flicker meter LiFli enables fast evaluation of lamps with regard to the flickering ratio (flicker/glimmer). Especially, in case of LED lamps, the flickering ratio can only be determined by a measurement, because it lies between 0% to 100% in case of these lamps. Audio functions enable an acoustic reproduction of the flickering. A voltage output for further analysis by oscilloscope or tension analyzer is available.